WordPress has (finally) started showing info on where our blogs’ readers are coming from, and wow! 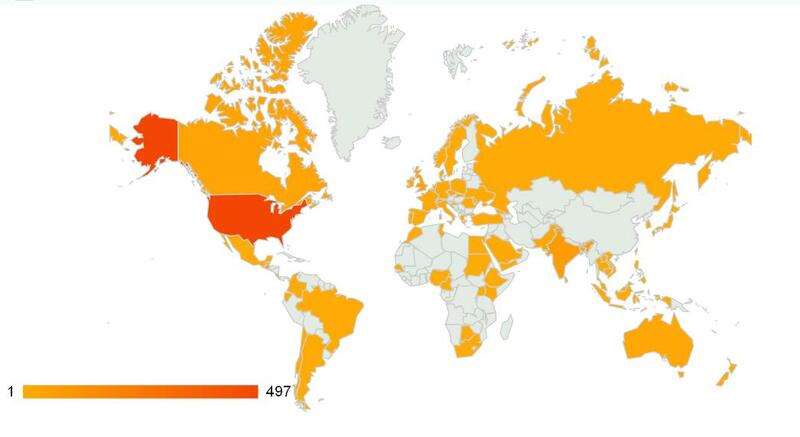 All the orange on this map shows that HWHTW is being read all over the world. HWHTW readers hail from 77 countries – our biggest following is in the U.S., followed by India, the UK, Canada, Australia, and Pakistan. We’ve also had visitors from Belgium, Brazil, Bhutan, Bangladesh, Botswana, Bahrain… and that’s just the ones that start with “B”! Welcome, everyone, and thanks for spreading the word about HWHTW! Entry filed under: Uncategorized. Tags: asia, Australia, Canada, Helping Women Helps the World, India, pakistan, uk, women.